Vatican City (AsiaNews) - During Holy Week, by praying "the Our Father, we can ask for one of these graces: to live our days for the glory of God, that is to live with love; to know how to entrust ourselves to the Father in trials and to say 'dad' to the Father and to find forgiveness and the courage to forgive in enountering the Father. Both things go together. The Father forgives us, but gives us the courage to forgive. " These are prayers addressed by Jesus to the Father during the Passion that Pope Francis reflected on to urge the faithful present at the general audience to pray with the same intentions of Jesus. Again today, in his greeting to French-speaking people, Francis recalled the fire of Notre-Dame. 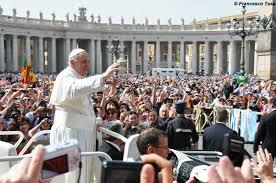 "Dear brothers and sisters - he said - I was very sad and I feel so close to all of you. The gratitude of the whole Church goes to those who have worked hard, even risking their lives, to save the Basilica. May the Blessed Virgin Mary bless them and support the work of reconstruction: may it be a choral work, for the praise and glory of God ". Previously, he had proposed "some words with which Jesus, during the Passion, prayed to the Father". The first invocation takes place after the Last Supper, "when the Lord, "raised His eyes to heaven and said: ‘Father, the hour has come: glorify your Son’ - and then – ‘glorify me in your presence with the glory I had with you before the world began’” (John 17.1-5). Jesus asks for glory, a request that seems paradoxical while the Passion is at the door ". But the "glory" of which the Bible often speaks "indicates the revelation of God, it is the distinctive sign of His saving presence among men. Now, Jesus is the one who definitively manifests the presence and salvation of God. And he does it at Easter: raised up on the cross, he is glorified (see Jn 12: 23-33)". "Dear brothers and sisters, let us make Jesus' prayer our own: let us ask the Father to remove the veils from our eyes so that in these days, looking at the Crucifix, we can accept that God is love. How often do we imagine Him a master and not a Father, how often do we think of Him as a severe judge rather than a merciful Savior! But God at Easter closes the distance, showing Himself in the humility of a love that demands our love. Therefore, we give Him glory when we live all that we do with love, when we do everything with our heart, as it was for Him (see Col 3:17) ". The second invocation is in Gethsemane: Jesus is alone, he knows that the moment of the Passion has arrived. "Jesus feels the "fear and anguish” of the betrayal, contempt, suffering and failure that await Him. In the abyss of his sadness and desolation, He addresses the Father with the “most tender and sweet word: ‘Abba’”, that is, Father. (see Mk 14: 33-36).In His trials, Jesus teaches us to embrace the Father in prayer in order to find the strength to go through pain. “Amidst trials,” the Pope said, “prayer brings relief, trust and comfort.” In His abandonment and interior desolation, Jesus is not alone, He is with the Father". "The biggest problem is not pain, but how it is dealt with. Solitude offers no way out; prayer, yes, because it is relationship, trust. Jesus entrusts everything and entrusts himself to the Father, bringing him what he feels, leaning on him in his struggle. When we enter our Gethsemane, let us remember to pray like this: Father ”. "Finally, the Holy Father drew attention to the third prayer of Jesus: “Father, forgive them, for they know not what they are doing.” (Luke 23,34). At the moment of His crucifixion, Jesus prays for those who were wicked to Him and His killers. It is at that moment of most acute pain, when His wrists and feet are pierced with nails and when pain reaches its peak, love reaches its climax. Forgiveness, the gift of immense power, then arrives breaking the circle of evil". 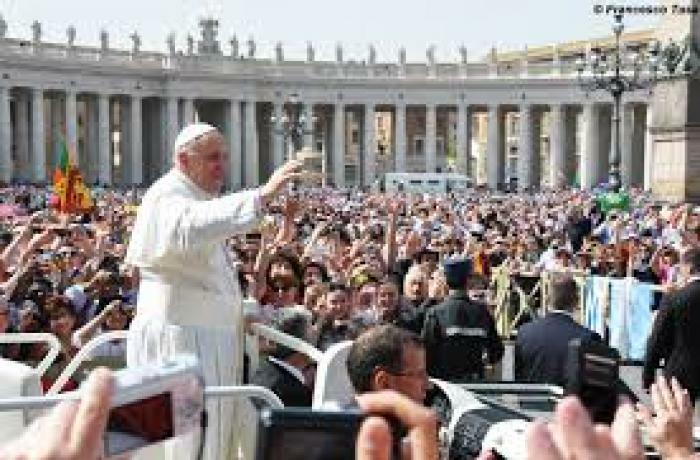 At the end of the audience, in greetings in Italian, the Pope expressed his hope that Easter will make the faithful reflect "on the love that God has shown to have for all of you". And "the Lord grant you to participate fully in the mystery of His death and resurrection, and help you to make His feelings yours and share them with your neighbor". The audience was also an opportunity for Francis to greet Greta Thunberg, the young environmental activist who is in Rome for some meetings.